If I was a very wealthy woman I would undoubtedly pay for a manicurist to look after my hands on a weekly basis. Using my digits for a living puts them under immense strain, causing my hands to become dry and my cuticles somewhat embarrassing after only a couple of days away from the manicurist’s chair; my nails often split and chip, while polish only lasts a couple of days before looking worse for wear. As a result I’ve built up a portfolio of products I rely upon to keep my hands looking as good as possible, while ensuring any essential maintenance is kept as faff-free and quick to manage. It may not be glamorous, but these are the products I rely on to keep my hands in as good a condition as I can muster between manicures. What did we do before these little pots were invented? I just can’t go back to using nail polish remover and a cotton wool pad, because it’s just so messy and time consuming; even manicurists have started adopting this method because it’s so effective. Although I’ve got so many of these magical tubs (from Maybelline, Sephora, Leighton Denny and even Primark,) this is my current favourite because it’s in mini form. Although you do need to work the nail about a little more to remove all traces of polish, the scent is a little less offensive than many others I’ve tried. Even when I only have a minute or two to remove my chipped polish and rush out the door, these pots do the job incredibly well. The key to healthy and elegant nails is a 4-way buffer; if you don’t have one of these then you need to get yourself one immediately. I adore the Sephora buffers as they’re so resilient and hardworking, not falling apart or looking like they’ve just done a double shift in Tracey’s Nails within a couple of uses – although if you can’t justify the trip to Paris a Boots own brand one is almost as effective. I was tipped off to their brilliance by Lily Pebbles during a trip to Paris and haven’t looked back since; they’re almost worth the Eurostar fare alone. Using the buffing and smoothing sides to perfect the nail will help to reduce any discolouration and uneven surfaces, helping your polish to sit better and nails to grow looking healthier in the long-term. If you’re not a fan of polish, then the ‘shine’ side will create the most light reflecting of surfaces and help your naked nail to look amazing. Not glamorous, but a nail essential. There’s something about a short and perfectly shaped talon that screams elegance and sophistication, so I regularly clip my nails to ensure they’re all relatively the same length. A good pair of clippers is a godsend because they help create a clean edge and minimise the need for a excessive filing, which often damages the nail if not done correctly. I’ve had these ones for longer than I care to remember and they’ve become a reliable friend, even helping to keep my tootsies sandal ready. I’ve got nail files all around the house – in kitchen drawers, on the bathroom shelf, scattered around my desk… A chipped nail in need of special attention is the most distracting thing in the world, so I’m never that far from a handy tool. However, this nail file from Stylfile helps to create a professional look thanks to the curved nature of the design; it’s been manufactured to mimic the natural curve of the nail for effortless ‘just stepped out of the nail salon’ talons. When I’m sitting down for a proper manicure session this is the one I use… Plus there’s a mini one you can attach to your keyring for use on the move! Where would I be without nail strengthener? A touch of treatment a couple of days a week definitely helps prevent as much flaking and chipping as would occur without it, plus it helps to nourish the nails when I’m constantly changing colour. (Nail varnish removes the moisture and makes nails more likely to break.) I’m really liking the Ciate nail treatments at the moment as they dry really quickly and leave my nails feeling instantly stronger; the toner is also great for when you’re in a hurry, removing all traces of nail varnish remover and neutralising the nail to ensure it’s in the best state for polish to be re-applied. Although I do love dry drops, I’ve recently got into polish fixing sprays. Maybe it’s because it reminds me of being in the salon, but there’s something quite satisfying about spritzing your nails with a fast drying spray and rushing out the door to get on with your day. This number from Kiko is affordable and effective, helping the polish to dry quicker to minimise smudges; although it’s not a miracle worker, it definitely helps to speed up the process by a few minutes. 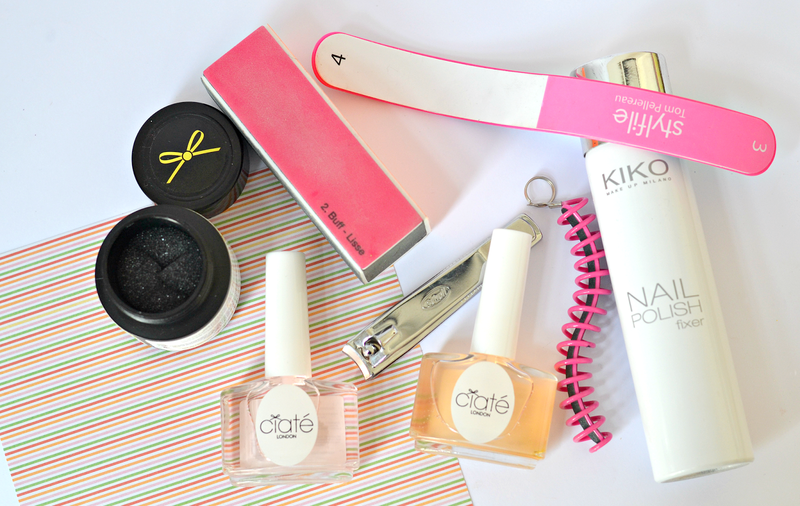 Do you use any of these nail tools? Do you have any others you rely on to keep nails looking fab? Previous Post Dirty Works Soothing Cucumber Eye Pads: The Answer To Tired Eyes And A Long Day? Now I feel guilty for neglecting my claws a bit, lol… 🙂 Especially my toe nails don't get as much love as they should. Fixing sprays and drying drops are definitely the way forward – make a big difference when you're in a rush/have a tendency to smudge! The pots are 100% better for glitter and textured nail varnish – because you 'soak' the nail and more remover penetrates and helps to lift. So much quicker than using cotton wool. It's amazing how a simple amendment can make such a difference – and nobody thought of it before! I'll definitely look out for them – thanks for the tip! I couldn't agree more with your first sentence…but as I'm in a similar condition I must take care of my nails at home as well. I only noticed that the nail polish removers pots tend to dry out both my nails and cuticles in a dramatic way. Does this happen to you as well? Unfortunately the more remover the dryer the nail, so it is important to keep up treatments/hand cream/cuticle oil. I try not to change my polish more than twice a week to avoid it – but it definitely is a bit of an issue.